Anti-wind farm laws introduced by the Coaltion government in 2011 have hit the Macedon Ranges hard. A large-scale blanket ban on wind farms now cuts across the electorate. 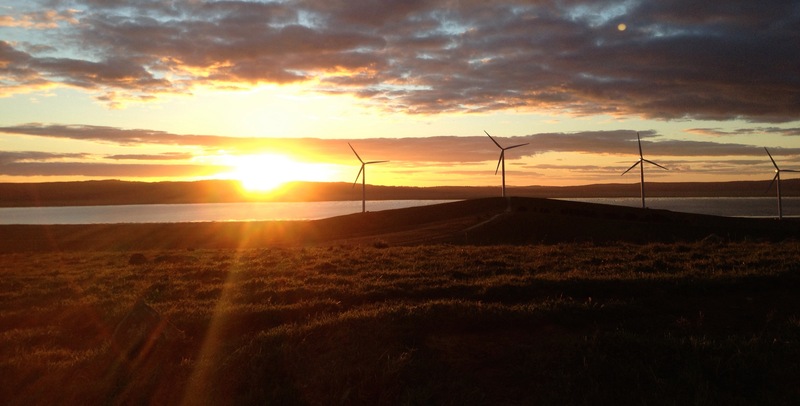 The anti-wind farm laws have cost the region jobs, investment and killed off a community wind farm proposal in Woodend. 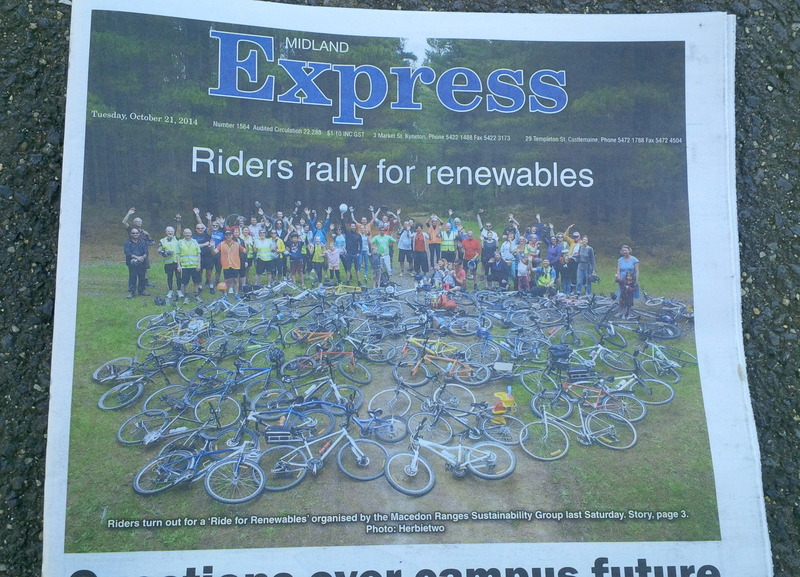 Enough clean electricity to power all the homes and businesses in Woodend, Macedon, Mt Macedon and Newham. Wind and solar power are surely the way to go to support a sustainable future for our nation. I would like to see wind towers in the Macedon Ranges and would encourage governments to support more strongly all forms of natural energy, but not including coal seam gas production. Years ago, we toured wind farms in California and they were an absolute tourist attraction. They did not detract from the scenery as they were sensitively placed. Since that time, they have contributed greatly to power-production in California and are a great asset to that state. Let’s hope the Victorian Government has a rapid ‘change of heart’ soon. Mr Hebbard is not alone in his aspirations for greater investment in renewable energy. Polling commissioned by the Climate Institute finds 71 per cent of Victorians support state government policies that encourage more renewable energy. It is evident that Voters will be paying close attention to each parties position on renewable energy. In terms of renewables in Macedon, where do the parties stand on implementing legislation which will lead to investment in the region? When it comes to removing roadblocks to renewables, the Labor party has vowed to ‘rip up’ the worst aspects of the Coalition government’s anti-wind farm laws. The opposition will remove the 2km right of veto that allows householders to block wind farms. It will be replaced by a 1km buffer zone (in line with New Zealand noise standards). Under a Labor government, the planning minister will return to the ‘responsible authority’ status, taking the burden of assessing planning applications from over-stretched local councils. A Labor government would exempt community wind farms from the “no-go” zones. The Liberal party will maintain the restrictions on wind energy, though fractures have emerged in the party over the issue. Candidate for Macedon, Donna Petrovich, has backed a site-specific exemption for a community wind farm in Woodend and an election commitment. Sitting Liberal MPs Simon Ramsay and Andrew Katos have also publicly supported exemptions for community wind farms. 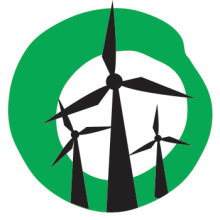 The Greens have a much clearer position: The party supports the full repeal of the restrictions needed to restore fair laws for wind farms in the state. The Labor opposition has offered conditional support for a Victorian Renewable Energy Target. 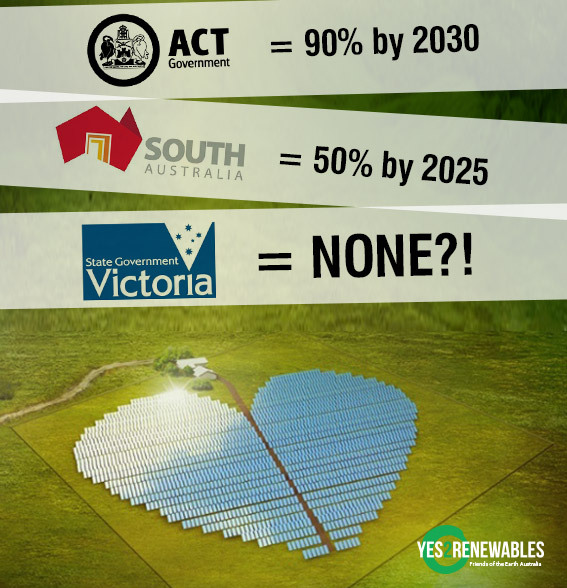 It will support re-enacting a Victorian Renewable Energy Target if the Abbott government axes the national RET scheme. The Coalition has failed to articulate its plan to grow the Victorian renewable energy sector, create jobs and unleash investment. With election only days away, there’s still time for the Denis Napthine and Daniel Andrews to bolster the renewable energy credentials of their respective parties. With strong public support for renewable energy, the party with the best plans for renewable energy will have an electoral advantage. 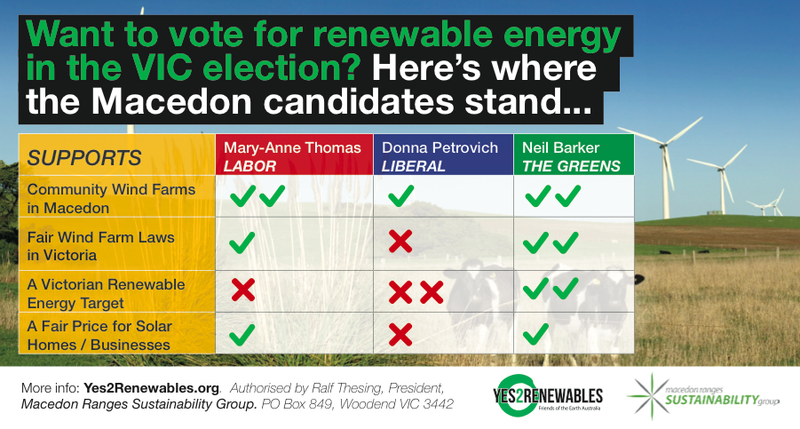 Previous Previous post: Election Watch: Where do Macedon candidates stand on renewable energy?